President Shimon Peres told the wife of convicted spy for Israel Jonathan Pollard that he had discussed the possibility of her husband's release during his meeting with US President Barack Obama on the sidelines of the AIPAC conference in Washington, Ynet reported Monday. Activists seeking the spy's release were disappointed that Peres did not mention Pollard during his AIPAC address on Sunday, but the Israeli president reportedly told Esther Pollard that he had appealed to Obama to release her husband. "I hope he will be released," Peres added. Prime Minister Benjamin Netanyahu was expected to raise the issue during his meeting with Obama at the White House on Monday. and release her husband immediately. Referring to Obama's announcement that Peres will receive the Presidential Medal of Freedom this spring, she said her husband's release would be "the real medal of freedom we are all waiting for." Last week, Jewish organizations in the US began distributing a video clip in which former top US officials, including Henry Kissinger, George Shultz and former CIA director James Woolsey, called on the Obama administration to free Pollard. Pollard, a United States Navy analyst convicted of passing information to Israel, has served 26 years of a life sentence. 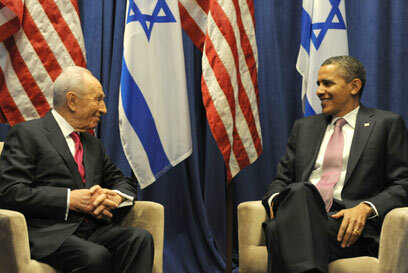 See all talkbacks "Peres says discussed Pollard pardon with Obama"